definitely not scandinavia. Could it be Tyrol? The flag looks scandinavian (Denmark, Sweden), but the architecture doesn't. 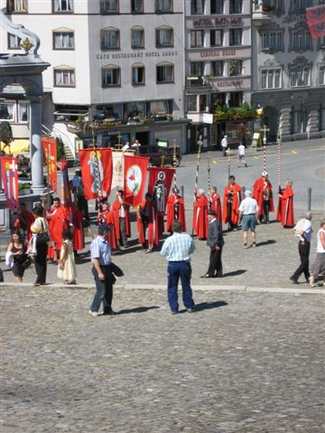 If you look tightly you see that the picture shows a religious procession, probably on the occasion of the (roman-catholic) feast of corpus Christi. Alas, there are very few catholics in Scandinavia. I assume the picture is taken somewhere in northern Italy or Switzerland.